It is one of the "high-risk" months of the hurricane season! 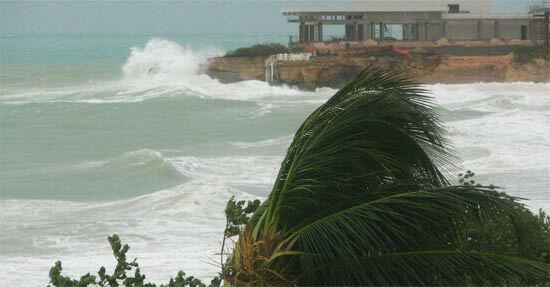 My family experienced this first hand in October 2008, when Hurricane Omar hit the island. Three days without electricity and running water in tropical heat is no picnic. We weren't badly hit though, don't worry, Nori. Where we are staying on the North shore was well-sheltered and protected from most of the storm. 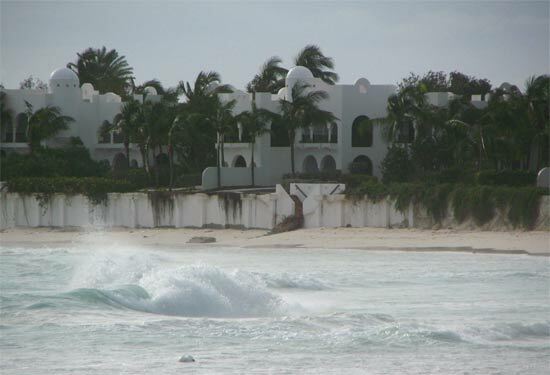 The hurricane's surge caused a lot of sand erosion, stripping it down to rock. Roughly 10 feet of sand is gone! 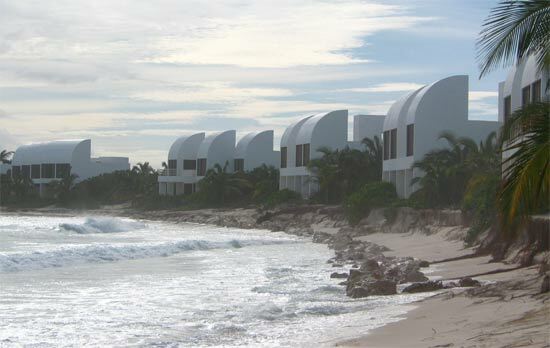 Most of Hurricane Omar's damage was surge-related, causing a lot of destruction to the beaches. The wind and rain damage was mild (by hurricane standards). 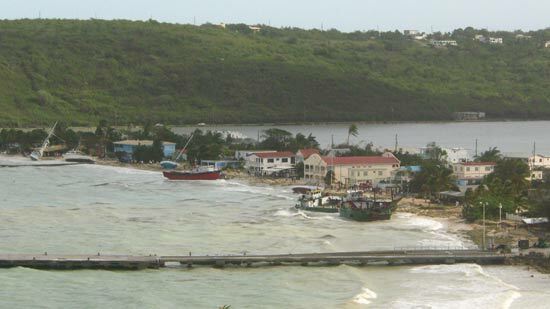 Hurricane Omar may have been classified by Anguilla weather experts as a Category 3, but the eye skimmed over Anguilla. It passed about 60 miles to the West of the island. Can you believe it? Hurricane Omar hit them hard. We even spent an afternoon helping Alan Piazzi shovel Trattoria Tramonto in West End out from under two feet of sand throughout the interior and the kitchen. The Dune was hit pretty bad, too. Bankie was still in good spirits though, "It's just nature, mon. The boat-bar washed ashore farther down the beach and we'll put all the pieces together in no time." It's hard to believe with all of that damage parts of the island were left unscathed. Our home-in-progress is fine, don't worry about that either! The storm didn't reach us. At worst Long Pond overflowed and blocked access through one of the roads, but we were still able to get through. All in all, there was about 6 hours of pure pounding, wind and noise. We slept through most of it, only waking up when the winds really started howling at 2 AM. The windows were vibrating and the doors were shaking, but nothing more than that. Still, I was shocked to see how quickly the hurricane passed. The few days before the storm hit, the skies were grey and rainy. Omar finally hit around midnight and had passed by 8AM. By noon, the sun was shining. The most exciting part of the storm? The island had "no current" (as they say here), but that didn't stop everyone from coming together and working to get the island back in tip top shape. 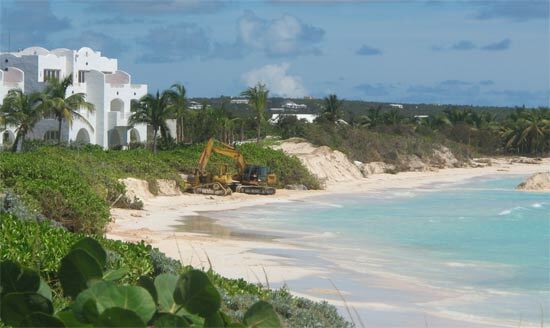 The power company was working around the clock, resorts were preparing for the coming tourist season, beach shacks were being nailed back together. An amazing, focused, well-organized island, everyone worked so hard. A few more days and you won't even know we had a hurricane (of course, the major resorts have more work to do).